" In the peace following the Great Mage Hunt, the king's long-time mistress is revealed as a sorceress. Locked away for the safety of the kingdom, bounties are placed upon the heads of the seven children she birthed. Mage hunters have scoured the kingdom for four years, searching for the seven scattered mage-born bastards. After growing up in an orphanage, Reshi discovers his parentage and learns to hide his magic, living peacefully in a remote village with an unusual friend. But when an alluring mage hunter comes to town, his secret is revealed, forcing Reshi to reach out to his brothers and sisters for help. A family reunion might be Reshi's only hope for survival--or it might become a spell-slinging battle royale. Who can Reshi rely on when his own family turns against him?" 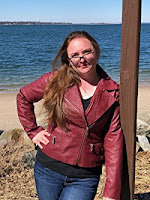 "Lifelong nerd and fangirl Kayleigh Nicol earned her Bachelor’s of Science in Animal Science at Cal Poly Pomona, California. After years of volunteering at zoos and aquariums in California, Kayleigh now works at a therapeutic horseback riding center in Long Island, NY. When not taking care of her own menagerie of rescued animals, she enjoys watching anime, playing video games and reading as many fantasy books as she can get her hands on."